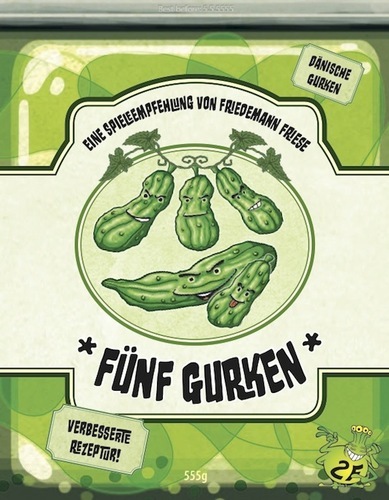 Dale Yu: First Impressions from Essen #5 – Card Games Part 1 – Funf Gurken and UGO! We’ve decided that we’re going to hold off on writing our group reviews until around Thanksgiving – in order to give as many of our writers a chance to play the games at the fall conventions (Great Lakes Games, Sasquatch, BGG.con, EuroQuest, Basement Con, Lobster Trap, etc) and allow for as many comments as possible on the new games. In the meantime, I thought I would write up some quick mini-capsule reviews of some of the new games that I’ve played. Most of the games have only been played once, so clearly my opinions are still forming on the games – but I know that many people are trying to figure out which games they want to buy/try first, and to that end, any opinions will be helpful. These thoughts will eventually be edited/incorporated into the full review that will come in the next few months, but I will try to talk about the new games a little bit at a time until we’re ready for full reviews. I will try to give a short description of the game(s) in each piece and some quick thoughts about them. 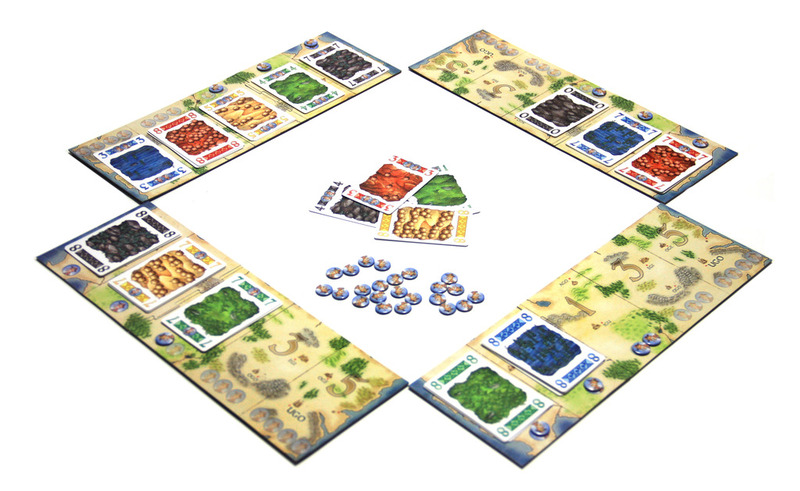 The rules are not meant to be comprehensive – merely enough to give a flavor for how the game works. Game Idea: A remake of a traditional Scandinavian trick taking game. Cards are rank 1 to 15, four instances of each. Each player is dealt 7 cards. After a card is led, a player’s choice is simple – either tie or beat the current card OR you must play your lowest card. The trick that matters here is the last one. Whoever wins the seventh and last trick of each hand much collect wooden pickles – equal to the number seen no the card he won the final trick with (ranging from one to five pickles). If someone is able to play a “1” rank card on the final trick, then the pickle penalty is doubled. 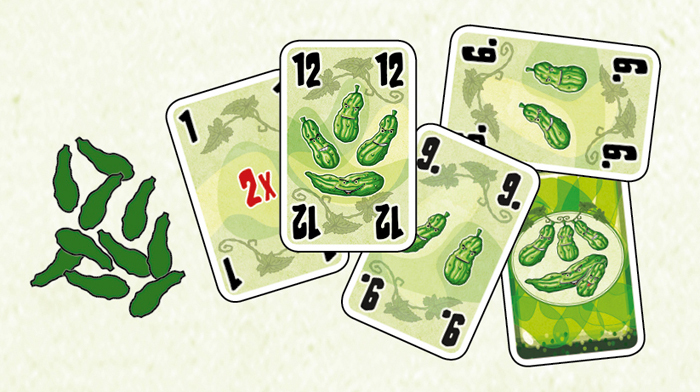 Players are eliminated when they collect five cucumbers. The winner is the last man standing. Thoughts: It’s a cute game with a minimal amount of strategy. Due to the card playing rules, your options on any given turn are severely limited. But that’s not to say that the game is completely brainless – there is definitely enough room to maneuver a little bit – and you need to do this in order to successfully play a “1” card on the last trick. But, for a 20 minute game, it’s just fine for what it is. You just have to accept that you are dealt a hand that plays you, and there are other times where you make the most of what you have. Game Idea: A trick taking game – where you collect the cards from the tricks that you win and place them on a board by color. Each of the five slots on the board holds cards of a single color. Depending on which card you win a trick with, you earn farmer markers. The 8 card (The highest rank) provides no farmers, while the lower cards can provide as many as three. You can also get farmers by laying off 1s and 2s. These farmer tokens go at the bottom of each of the 5 spaces. If a space has enough farmers, you score positive points equal to the value of the top card in that space. If you do not have enough farmers, you score -5 points for each farmer you’re missing (and do not score for the card there). The game lasts four short rounds, each the same ten tricks. Thoughts: Wow, I have been impressed by my two games of this so far. At its heart, it’s a trick taking game with a few rules twists. 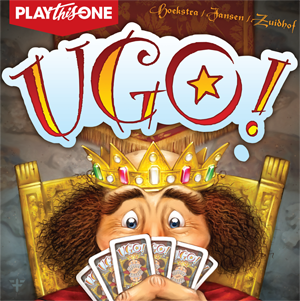 But those rules changes made a big difference to the game and elevate UGO to be more than just another card game. The beauty of the new rules is that hands with only low cards can still be useful AND having a hand chock full of high cards can actually be a liability because it’s not always a good thing to win all the tricks. Having low cards are nice because you can slough them off and ruin someone else’s scoring. You can also generate a lot of farmers for yourself if you’re dealt a lot of ones and twos. Playing offsuit can also drive someone to huge negative points is they don’t have enough farmers and they are forced to collect a card of a 4th or 5th suit. It is definitely a dangerous proposition to be leading the last trick because you’re never quite sure what you’re going to be forced to collect if you win that trick. My only quibble with the game is that the scoring system is such that there can be huge swings of fortune. We once had a player take -35 in a single round from not filing the last two spots on his board. Despite that, the games have been exciting, and very few hands are awful because just about every card has a value in being played at the right time. This entry was posted in Essen 2013, First Impressions. Bookmark the permalink.